No Common Core Maine was launched in August of 2013 to raise awareness and educate the public, parents, educators, and legislators about the real intentions of the so-called Common Core State Standards (CCSS). At that time there was no serious discussion in Maine about this agenda. No Common Core Maine has been working hard to change that. We have learned over the past year that the CCSS is really a package deal that is designed to create a standardized national curriculum, testing, and monitoring system that is controlled by the federal government and the testing and high-tech industries. What we call the "Standards", i.e., what Maine agreed to do in order to receive a waiver under No Child Left Behind and seek funding under Race to the Top, includes not only the Common Core State Standards, but also high-stakes testing under the SMARTER Balanced Consortium, data sharing, and teacher— and school evaluations based on that testing and data collection. Not a single element of these major reforms of our public schools has ever been tested. Common Core is the largest uncontrolled experiment in the history of public education. The insidious nature of the CCSS and the patently undemocratic and unconstitutional way in which all of this was sprung on Mainers makes it imperative for us to stand up, educate ourselves, insist that our voices be heard, and demand that lawmakers protect the children of Maine from a massive trap designed to limit the potential of our future generations. A Nationalized Curriculum – The combined effects of the CCSS, the "aligned" SMARTER Balanced and PARCC tests and teaching materials, and the data-based evaluation of teachers and schools-all created by private corporations and Washington bureaucrats-will force a de facto national curriculum on nearly every school. The Common Core Standards – The CCSS were said to be the creation of a "state-led" initiative that was driven by teachers and benchmarked against international standards. We now know each of these statements was a lie. The CCSS is really the brainchild and product of a small, select group of individuals, mostly from the testing industry with a few academics and consultants. No serious input was taken from public school teachers, parents, or students. The CCSS was funded by the Gates Foundation, which gave generous "grants" to a wide variety of organizations, including the national teachers unions, in order to gain endorsements. The CCSS were never "benchmarked". They are untested. Aligned Testing – This has already begun in Maine with pilot testing this year, and not surprisingly teachers are testing and coaching more and teaching less. College entrance exams are impacted as well, since they are will be "aligned" with the CCSS. In fact, David Coleman, the recognized architect of the CCSS, and several other key consultants, now run the Educational Testing Service that writes and administers the SAT. Aligned Evaluations for Teachers and Schools – Based upon students' testing results, teachers and schools will be judged by computer-generated evaluations. Where is the human factor, the mentoring, the measurement of their student engagement? They will be de-humanized and made the fall guy for a corporate-federal top-down agenda. They will be stripped of their profession and professionalism. Aligned Materials – Not surprisingly, the large and small educational publishers are now rushing out "CCSS-aligned" materials and software in response to the testing and standards. Many of the materials are just re-packaged versions of existing products; yet schools are spending large sums on these materials to "get aligned". Clearing houses of "aligned" materials are also appearing. These will further force a nationalized curriculum on our children and schools. And many of these materials have strong political and social biases. The End of Local Control of Education – The major reform players, including the US Department of Education and testing and software industries, want to end local control of education in order to implement a national education plan that is part of a larger economic agenda to create a "globalized" workforce. Data Collection – The heart of entire CCSS reform plan is the collection of vast amounts of data about students, their families, schools, etc. from which decisions will be made about curriculum, educational policies, performance evaluations. The data will also be used to create products for sale. The Global Labor Market Pipeline – The CCSS sees our children as little more than cogs to be integrated into the Global Labor Market. The plans of the reformers are to restrict the focus of public education strictly to the demands set by "The Market". Education will have little to do with the sort of real intellectual development needed for a democracy; it will become schooling for employment. "Remold the entire American system" into "a seamless web that literally extends from cradle to grave and is the same system for everyone," coordinated by "a system of labor market boards at the local, state and federal levels" where curriculum and "job matching" will be handled by counselors "accessing the integrated computer-based program." And change the mission of public schools "from teaching children academic basics and knowledge to training them to serve the global economy in jobs selected by workforce boards." [S]tate efforts to improve student achievement should focus on workforce policies and practices, and on workforce funding decisions that improve the quality of the education workforce. To do this, governors should consider a comprehensive human capital approach that strategically invests in teachers and principals and that, in turn, can improve student outcomes. In short, CCSS is built on the idea that Our Children are merely Human Capital to be used in a Global Labor Market where the elites determine what jobs need to be filled and whom to fill them. It doesn't have to be this way. We can stop this coming train wreck by stopping the train now. 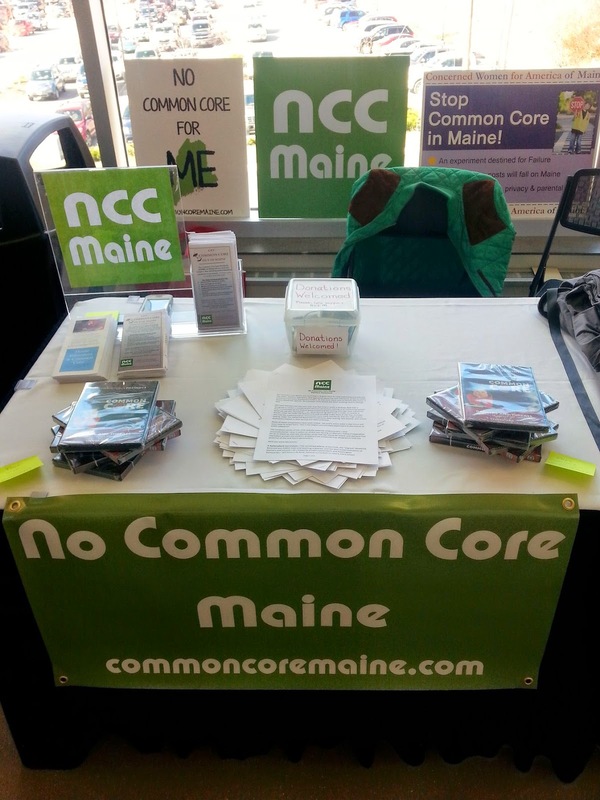 Reject the CCSS Agenda – Maine should quit the Common Core State Standards and SMARTER Balanced Consortium. Maine's Department of Education had no legal authority to bind our state to either agreement, since the terms of those agreements intrude on school policies that are reserved under out state's constitution to the local school districts. These agreements are null and void. Develop Standards and Evaluations That Are Right for Maine – We have rushed to implement the CCSS agenda without ever considering the strengths and weaknesses of our last major reform, the Maine Learning Results. Instead of foisting yet another major reform on our teachers and families, let's stop now, decide what we want for public education in Maine, consider the effectiveness of the Learning Results, and then decide what reforms are needed. Legislate Comprehensive Protection for Student and Family Data – Before Maine undertakes further collection of data about students and families, the legislature must enact strong, clear laws protecting our privacy and preventing the use of such data for commercial purposes. Strengthen Local Control – Maine's constitution (Article VIII) expressly reserves the responsibility of public schooling to the communities, not the state. Maine law (20-A M.R.S.A. § 6209) places the responsibility for curriculum with the school board. The Maine Supreme Court has held that school boards have "wide latitude in managing" curriculum. The actions of the state DOE in signing the MoUs and pushing CCSS, SBAC, and teacher evaluation, is nothing less than a flagrant trampling of local control. We need to strengthen local control by requiring training for school board members so they will understand their roles and responsibilities, and the differences between the functions of the board and the administrators. Many of us who have participated on school boards in this state have seen how board members become confused and intimidated by superintendents and other administrators who use state DOE pronouncements and questionable "research" to push a technocratic agenda that wastes the time and money of the community. Boards certainly should be respectful of the administrators, but their function is first and foremost to set policy for their districts. Board members deserve respect, and administrators and the public should understand and respect their role and not push agendas that usurp the board's rights and responsibilities.